Slowly, but surely - the last day is approaching. My mind knows it's the end of the school year. 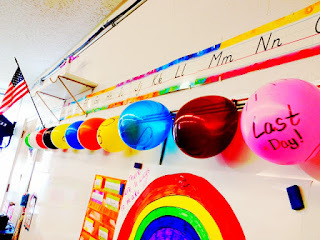 Each day I count down the days with my students and at the end of each day we pop a balloon on our countdown. We started when there were 10 days left. I pick 2 students each day to pop the balloon and they get the candy inside. Just a fun way to count down the days. This is not my picture, but ours looks a lot like this. Anywho - as I was saying...my mind knows it's the end, but it hasn't hit my heart yet. Mentally and physically I am exhausted and soooo ready for summer, but emotionally I am not there. This is my first year teaching first grade and I have fallen in love with these little cuties. Each day I run down the hallway to the 2nd grade teachers to share a little story or bit of info about my little darlings. I could write a book about each child - what they like, dislike, what they order for lunch, what color their sneakers are, when they go to the bathroom each day. Ok, I know that's WAY too much information, but let's be honest - some kids are just regular!!!! So yes, I know next week when it finally hits me that I am saying goodbye to these little kiddos, I will be devastated. Four of them are actually changing schools too, so I REALLY have to say goodbye to them :-(((( I will see the rest in the hallways and get some familiar hugs, but it won't be the same and we will have all moved on. It's very bittersweet! Moving along so I can fight back the tears. Back to our Calendar Countdown!!!! We have had a VERY rainy week!!!! Many of our activities have been rained out this week, but we still had some fun despite the rain. Monday - Reaching our Goals. We first started by discussing our September goals and New Year's resolutions and see how we had done now that we are at the end of the year. They all wanted to become better readers (or just readers for some) and they DID! They wanted to learn how to add and subtract "bigger" numbers - and they CAN! We reviewed some of the fun projects we've done throughout the year and units we've worked on. This was a great lead in to our 1st Grade Memory Book (you can find it in my Farewell Firsties pack). We spent a little time each day reminiscing and filling out the information in our books. 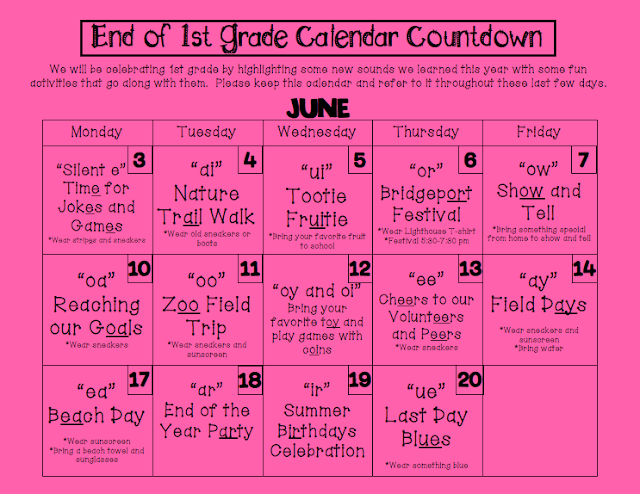 We also talked about our goals for next year in 2nd grade. 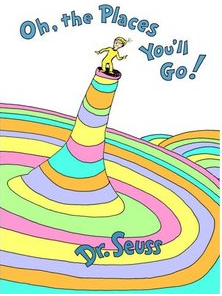 I read them an all-time favorite: Oh, The Places You'll Go by none other than Dr. Seuss. Then we made these balloons to share what we were most excited for in 2nd grade. The plan was to play a kickball game against the other 1st grade class for some fun, but it was raining. Instead, we played some more Red Rover, Red Light, Green Light, and What time is it Mr. Fox? in the gym. Not much to say except --- guess what ---it RAINED!!!!! It wasn't a total wash out, but it never really stopped drizzling. The best part was ALL of the animals were actually out and active instead of hot and sleepy. So that actually made it one my favorite trips to the zoo. The penguins were SO interactive. They were following the kids fingers wherever they went. So fun to watch! This little baby monkey was unbelievably cute I had to include his picture. Most of the time he was being carried by his mom, but here you can see how small he is. Precious! The kids of course loved bringing in a favorite toy and sharing it with the class. We had cuddly blankets, stuffed animals, dolls, magnets, a guitar, Pokemon cards, and of course one kid had to bring in a video game cartridge. During math we used coin stamps to make a little flip chart - sorry no pictures :( We also sorted coins, played Money Memory, and Collect $1.00. Today we had an assembly where we honored our school volunteers in the morning. This is always so nice because the whole school is together and claps for the volunteers while they each get a certificate. We LOVE volunteers!!!! We also voted on classroom awards. First I read the book No More Pencil, No More Books, No More Teacher's Dirty Looks! by Diane deGroat. 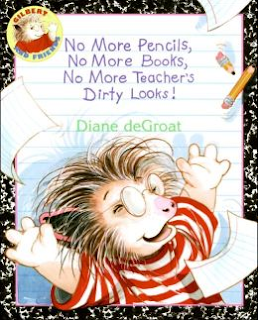 This is an adorable book about the end of the year and how each kid gets an award in the class. Then I have the kids vote (privately with me) on which awards should go to each student, including themselves. I tally up the votes. 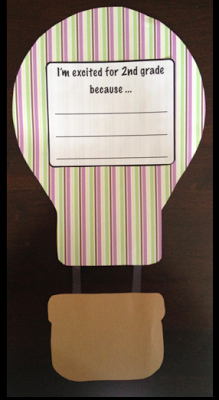 I try to give each child the award they voted for themselves for because obviously it was something that meant something to them. Of course, I only do this if it fits the bill. Then I give them another award that the other kids voted for. Each child gets 2 awards this way. I tell them they are the two awards that had the most votes. 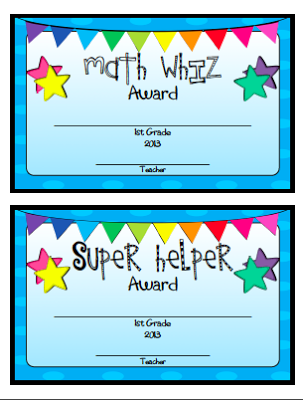 Here are just 2 of the 26 different awards I have (also in Farewell Firsties). Finally, today was supposed to be Field Days, but guess what the weather was ----- Yep, RAIN!!!! So we have a rain date on Monday. We'll have to see what Mother Nature throws our way. Here is what I had to pull together quickly worked tirelessly on for Father's Day. I took pictures of the kids holding signs. They could choose You're the Best, Best Dad Ever, I love you Dad, or Happy Father's Day. I have a couple kids whose father is not in the picture for one reason or another so they could choose Happy Father's Day for a grandpa or someone, or You're the Best for anyone. I also changed the poem for them and just printed one out without the word Daddy on it. They did turn out cute! Happy Father's Day to all the fathers out there. I hope you enjoy a day of golfing, watching sports, fishing, or whatever it is you like to do. I'm sure your families will make you feel special! Only 4 more days of school left for me! I finished school about two weeks ago. It seems as if wave two of school are finishing. I'm reading all these posts about end of the year activities (and keeping them in mind for next year) and hearing about the sadness to see a class move on--and for a moment miss 'my' kiddos again! I just found your blog and I'm your newest follower! I love the calendar you used for June...very cute!